Forget Catherine Deneuve and Carole Bouquet. 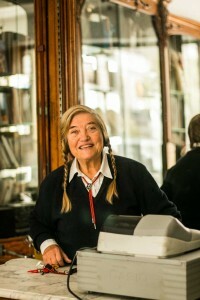 The most photographed and revered woman in Paris is Denise Acabo. 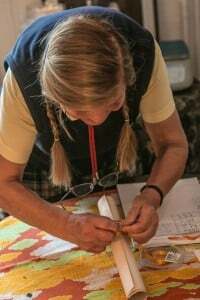 With her braided pig-tails, necktie, and crisply-pleated kilt, Denise is the sweetest woman in Paris. Her shop, A l’Etoile d’Or, has an ethereal selection of artisan confections and chocolates from France and whenever I go, I invariably find something new to try, something tasty, something that is so amazing, that I’m compelled to go back for more. What’s a guy to do? I give myself at least one hour to shop. Minimum. Words fly out of her mouth in rapid-fire French. She’ll often use the tu word, instead of the formal vous, which suggests immediately comradery. Don’t understand a word of French? That’s ok, Just nod. She’ll keep going. 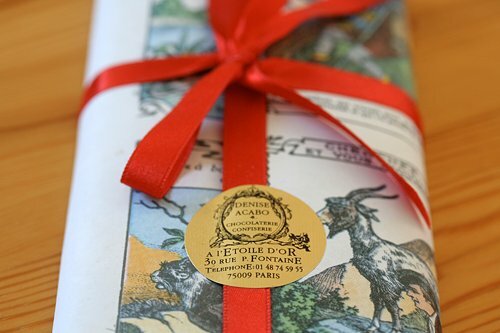 The main reason to visit A l’Etoile d’Or is simply because it’s the only place outside of the original shop in Lyon that sells Bernachon chocolate. If you’ve never had anything from Bernachon, close your laptop and get on the next flight to Lyon. Bernachon is one of the handful of chocolate shops in the entire world that makes the chocolate they use from scratch. That’s right, folks. They buy sacks of cacao beans, then roast and grind them into pure, dark bittersweet chocolate. And what chocolate it is! There’s the Moka bar, chocolate ground smooth with espresso beans. 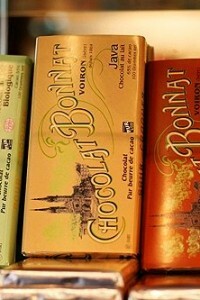 Nuit et Jour (night and day), a tête-à-tête with part of the bar made with dark chocolate, the other half milk chocolate. Or how about a bar filled with Sicilian pistachio paste? Or another filled with rum-soaked raisins? Some twenty years ago, Denise actually got down on her hands-and-knees and begged Monsieur Bernachon if she could please sell their chocolate. (What do you say to a woman in pigtails, wearing a tie, down on her knees?) So an alliance was formed, and you’ll find stacks of these fine bars of chocolates lined up at her shop. When I was there last week, I lucked out–there were many stacked up. Other times you’ll find her stock dangerously low. 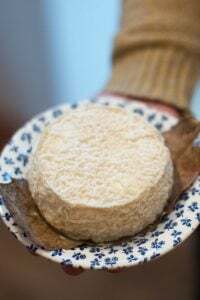 Denise carries chocolates from selected French artisans such as Bonnat and Weiss, which makes a fantastic white chocolate flecked with vanilla seeds and is almost impossible to find. Having high standards, she is one tough customer. She refuses to carry chocolates that contain lethicin, an emulsifying agent used in small quantities by some chocolate makers. And once I told her I was going to bring her in some homemade Rocky Road Candy. When she asked what it was, I responded “Homemade marshmallows, roasted peanuts and cocoa nibs enrobed in dark chocolate”, a dark mood crossed her face. She leaned down, lowered her forehead and her voice, and said, “I won’t allow peanuts and chocolate together in my shop!” …perhaps an allusion to US-based candy bars which are infiltrating France. 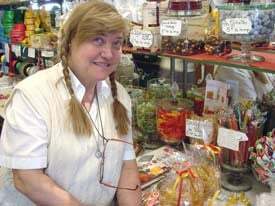 The candy bars she will carry are from Bernard Dufour, who makes chocolate near Lyon, like Bernachon. I suspect if you were stressed (or depressed) this hefty, jumbo Anti-Stress bar would smack you right upside the head and lift you right out of it. 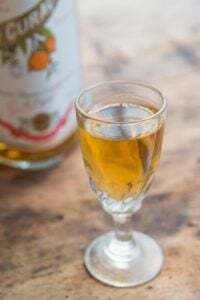 Other tablets from Dufour are beautifully embedded with glacéed orange and lemon peel, and vividly-green pieces of candied angelica. And unless you’re planning on heading to the coastline of Brittany, I know of nowhere else where you can get the superb CBS caramels from Henri Le Roux, the best caramel-maker on earth. CBS means Caramel-Beurre-Salé (caramel-butter-salt) and she’s got ’em. I crave nature (plain) the most, although she always tries to seduce me by unwrapping a different flavor and popping it in my mouth. 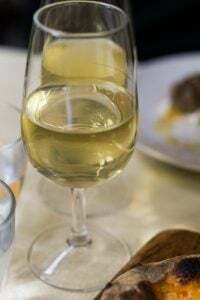 I did agree with her that summertime is the best time to enjoy the citron vert (lime) which was as refreshing as a caramel can be. 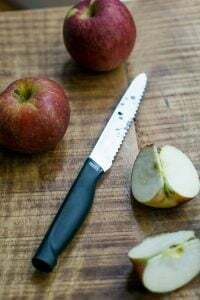 Other times she’s tried to persuade me with fresh ginger, chocolate, pomme Tatin, reminiscent of the famed caramelized apple tart. 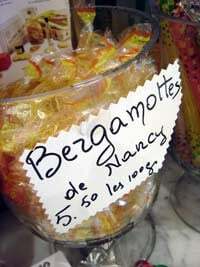 English tea drinkers will love Bergamottes from Nancy, a lovely city in the Lorraine region (best known for it’s quiche), where these hard candies originate. Flavored with the balmy citrus bergamot, it’s best-known as the essential and unmistakable flavoring in Earl Grey tea. I’m not a big fan of the candies; their taste reminds me a bit too much of lemon furniture polish (she also stocks marshmallows scented with bergamot, as well as fruit-flavors and vanilla, my favorite), but you’ll find barley sugar lollypops and pâte des fruits, those marvelous sugar-crusted fruit gels made from natural fruit juices. I’ll never forget when she scolded me for choosing my Bernachon bars when my hands were hot and sweaty. 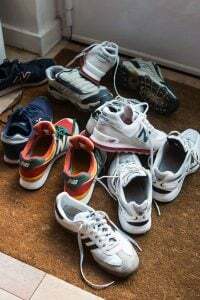 I had walked so quickly from Galleries de Lafayette on a warm day as if a giant magnet pulled me towards her wonderful shop. A shop not to be missed when one is in Paris. Denise and her chocolates……….magnifique! When Melissa and I were last there, she was all out of the Palets d’Or from Bernachon. We were heartbroken, especially when she told us a Canadian had bought up the rest of her inventory that morning! Melissa and I kept our eyes open that day for anyone popping these candies, so that we could mug him and take some of his stash. Or at least beg and plead him to sell us some. It’s always fun to visit Denise. When we went last October, she talked to me and my friends about how hard it was to get a good blanquette de veau at a Paris restaurant and the nunnery where her marshmallows came from. Then she explained all the riddles on her crazy medieval wrapping paper. She is really the sweetest, and most unpretentious lady in Paris. She’s always so excited and enthusiastic about her products. I hope her leg is better. The pistachio Bernachon bar, which is filled with pistacho paste and studded with pistachios is my fave, along that dark chocolate praline filled with a candied manadrin orange. I like the pistacio bar, but the Kalouga, filled with rich salted caramel was the best (I have to say ‘was’ since they no longer make it, I think…). And Denise’s leg is better; she’s not hobbling around anymore. Derrick, although Bernachon’s are super, when you come to Paris we’ll go to my all-new favorite place for palets d’Or. Darn those Canadians for buying them all! I just came back from a quick visit to Paris having no plans beyond getting a hotel at the foot of Montmartre. Thank goodness for Internet cafes. I checked your website for 10 insanely delicious things and found that I was within walking distance of A l’Etoile d’Or. Wow, thanks so much for that post. 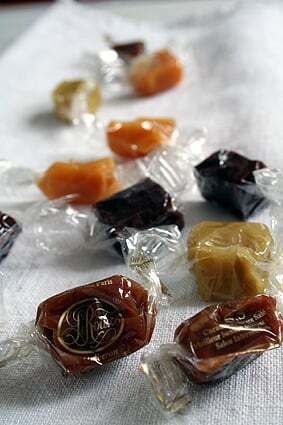 Nothing beat the CBS caramels, although I have yet to try the Bernachon chocolate bar that Denise said you adore. I’m saving it to open when celebrating US election returns! Thanks, David, for the recommendation. I went to visit her twice and wow! That CBS and she even had some of J. Genin’s caramels in store! That was as close as I could get to anything he makes. And I was happy. I’ve been there yesterday and unfortunately Denise is on vacation until 26th August ! Yes, like many businesses in France, most close near the end of July and re-open in late August. It’s always best to call first. Next time! I went to Paris for the first time last weekend, and randomly popped into this shop. I unfortunately don’t speak a word of French (terrible, I know), but Denise (as you mention) doesn’t seem to have a problem with lacking language skills! The first thing she showed me was your book on chocolate, you’ve got a living, breathing advertisement there! I made a Google map full of your Paris suggestions to take with me, which I then promptly forgot at home. (This just means I have to go back. Soon.). Thanks for a great blog! Hello David. I’ll be stopping by Paris for one day. Unfortunately it is a Sunday! No Bernachon or CBS for me! 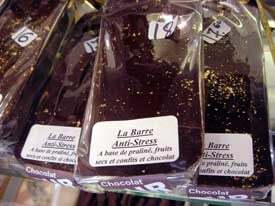 Do you know of a similar chocolate shop that is open on Sundays? Thanks! tiptup: Just about all the candy and chocolate shops I know of are closed on Sunday. Ladurée on the Champs-Elysées is open (I think the one on rue Royale is, too) and perhaps that La Maison du Chocolat on the rue de Sèvres may be. Loved your restaurant recommendations. Treked the kids over to find the space empty, sign missing, plastic on the windows. There was still a small candy sign outside. Are they remodeling? Did they move? I’m yearning for some CBS. Sophia: I was just there last week, and Denise told me she was expecting a big shipment in, so it sounds like you were at the wrong address. i was there last saturday (the 28th, actually!) and i promise the shop was open and bustling. i was surprised at how much she talked to me, since it was my first visit ever to her shp… but i was treated as if i were a neighborhood local. and boy, she’s so fun to talk to! and now i can’t wait until i finish eating the yummy bar of chocolate i bought so i can go back, have another nice long conversation, and walk out with more deliciousness! thank you for this blog entry! 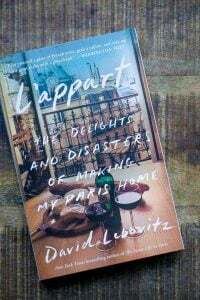 I always love reading this blog but it’s even more wonderful this time because I’ll finally be in Paris next week so am busy scouring every good address to try and have the most gourmand trip ever. This place has to be top of my list, even though I’m already dreading the idea of hauling all those jars of caramel back to Berlin. Still, it’s for a good cause! I met Denise today, love her pigtails!.. as u said, she will just continue talking even though you don’t understand french.. But the best thing is I get to buy the fresh shipment of the Kalouga chocolate!.. fyi, new shipment comes in every Friday.. hee.. I hope to come back here soon!.. Au Revoir!.. she’s very friendly and a superb sales lady! sure knows how to make pple so happy till they want to buy some of her chocolate! 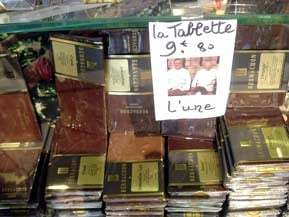 argh…i chalked up 51 euros on 4 bernachon bars, and 2 boxes of ‘Atlantique sable croquant et caramel tendre a la fleur de sel’! haven’t tried the bernachon, but caramel tendre is FANTASTIC! i don’t like caramel in general, but this goes so well with some sort of crunchy cookie layer! Thanks david for your recommendation! i’m visiting a number of places you recommended….5 more days in paris! I went to Paris last week and dropped by this store. Really wonderful experience; she is a lovely lady. Thank you for the recommendation. I got Bernachon chocolate, the nougatine one, i have a inclination for nougatine, it reminds me of French marriage cakes made with it! I also got caramels and left some for other customers! I spoke a bit of Italian with her and told her my passion for Sicily (where her husband was from), she told me about you too!!! Visiting this shop and being greeted by Denise was a highlight of a Spring vacation… she’s is truly a character ! Do you know the shop’s vacation schedule as I’m hoping to arrange for some more of the salted caramels to be brought back to San Francisco by friends vacationing in Paris mid July to end of August. Thanks. 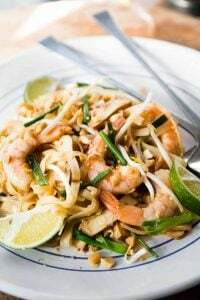 Love the blog, thanks for all of your fantastic food recommendations!